It is precisely on those coldest days of the year when you most need and appreciate the convenience of opening and closing your garage door quickly. Sadly, that's exactly the kind of day when moisture and cold can conspire to make this difficult. Garage doors can and do freeze to the garage floor. Sometimes it is just a minor icy connection between the two that can be broken when you hit the opener button. If the door refuses to budge on the first attempt, though, resist the urge to keep banging on the automatic opener button. This is likely to cause a more serious problem with the garage door opener—including, but not limited to, stripped gears, broken springs, and a burned-out motor on the opener. Should an object or individual become trapped, or if a malfunction occurs, pulling on the handle will allow the user to manually lift the door up or down. 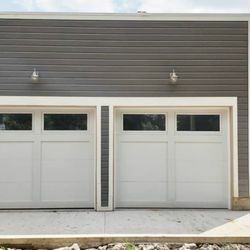 If a garage door is good working order, the spring system that runs across the top of the door opening should provide enough assistance so an average adult can lift the door with relatively little effort.